As a way to say thanks to our loyal readers, We Love DC will be giving away a pair of tickets to a 9:30 Club concert to one lucky reader periodically. (In this case, it’s actually a concert at U Street Music Hall presented by the 9:30 Club!) Keep your eyes open for opportunities at 9am once a week or so to find out what tickets we’re giving away and leave a comment for your chance to be the lucky winner! Today we are giving away a pair of tickets to see The White Mandingos at U Street Music Hall on Friday, Sept. 27. 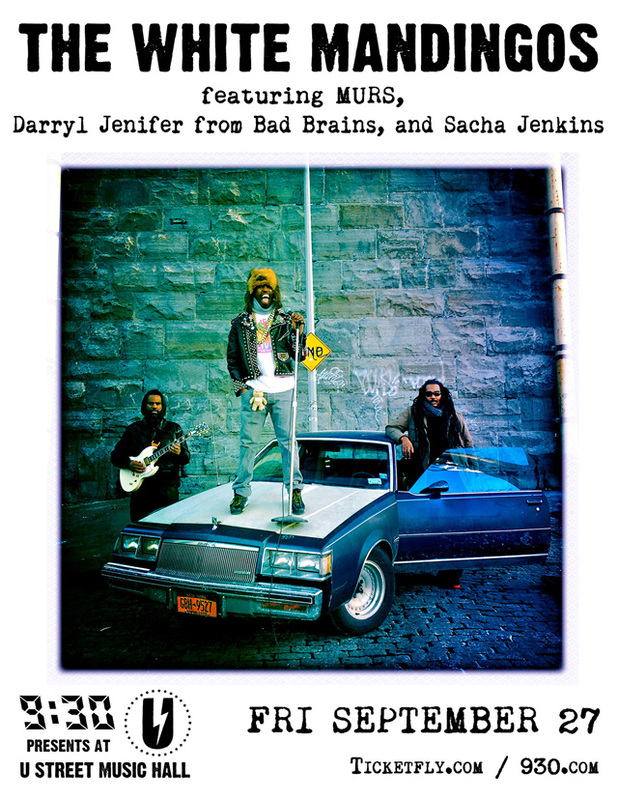 The White Mandingos is a bicoastal supergroup, featuring MURS, Darryl Jenifer from Bad Brains and Sascha Jenkins. The hip hop/rock fusion trio released their debut album, The Ghetto is Trying to Kill Me, on Fat Beats/Fontana on May 28. For your chance to win these tickets, simply leave a comment on this post using a valid email address between 10am and 4pm today. Feel free to leave any comment, but perhaps reveal your favorite composition by MURS, Bad Brains or Jenkins, or this new supergroup! One entry per email address please! Tickets for this show are also available through Ticketfly. Comments will be closed at 4pm and a winner will be randomly selected. The winner will be notified by email. The winner must respond to our email within 24 hours, or they will forfeit their tickets and we will pick another winner. Tickets will be available to the winner at the U Street Music Hall Guest List window after doors open on the night of the concert. The tickets must be claimed with a valid ID. The winner must be old enough to attend the specific concert or must have a parent’s permission to enter if he/she is under 18 years old. I’m a big fan of The White Mandingos. I hope I win the tickets. You should just go ahead and give them to me.